When was the last time you started up a game and saw a personal message from the programmer thanking you for buying and playing his product? Maybe a better question is, have you ever seen that? Sure, when you beat many games you may get a nice photo of the design team thanking you for playing. Or at least the final credit that rolls is a simple “Thank you for playing”. To wit: I just beat Fallout 4 after playing for about 85 hours and I didn’t even get a thank you. No Christmas card, no photo, no “atta boy”, nothing. After 85 hours, and after buying the preorder, season pass, and ultimate strategy guide with faux leather cover (you can smell the benzene)! Is it possible that companies that produce AAA titles feel like they are doing you a favor by making games? So it’s a beautiful thing when you first start a game and see a picture of a game designer with his son, and a heartfelt message thanking you for playing- before you even play. Sorry. Before you even die. Which I did on the start screen, before I even started playing. 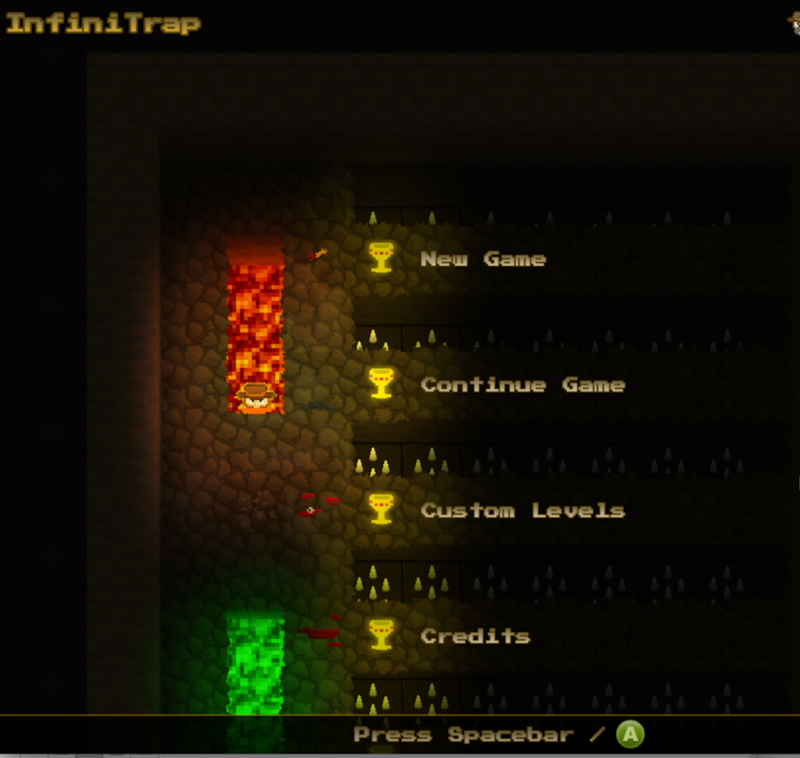 In Infinitrap you play Ohio Jack, who has toiled for decades in search of a legendary treasure. One day, he Googles the cup and finds that the location is “pretty close to him”. Yes. That is the premise of the game. If it seems a bit thin…it is. Once you actually walk to your selection, you are greeted by Culsu, who promises to resurrect you if you die in search of a golden chalice. See, Ohio Jack is a really nice guy who is always terrified. With good reason, as well…because Ohio Jack can barely walk in a straight line for five feet before getting impaled on something. The gameplay is very simple. Move, jump, and duck. That’s about it, and hell, if there were more it would just be aggravating, in an Otto and George for of way. That’s because you are constantly dodging, ducking, diving, and dodging out of the way of something that will kill you instantly. That’s right, one hit kills, the way King James intended. Now, what we have here in this game is an odd dichotomy of sorts. On one hand we have a somewhat goofy looking, cartoonish flatformer. On the other hand, we have an ultra violent, death-obsessed horror show. I’ll explain. See, Infinitrap looks like you should play it with your five year old son, as the 8-bit-ish graphics are stylized in an innocent enough Playskool manner. However, ten seconds into the game you realize that this is not Playskool… this is PAINskool. You’re going to die. That’s just the way it works. You’re going to die a lot. I’m typically not the type of gamer who goes for games that are rote memorization-based, and full of inevitable failure. Infinitrap straddles the line between knowledge, reaction, awareness, and pure anger. or, of course, eaten by a zombie. 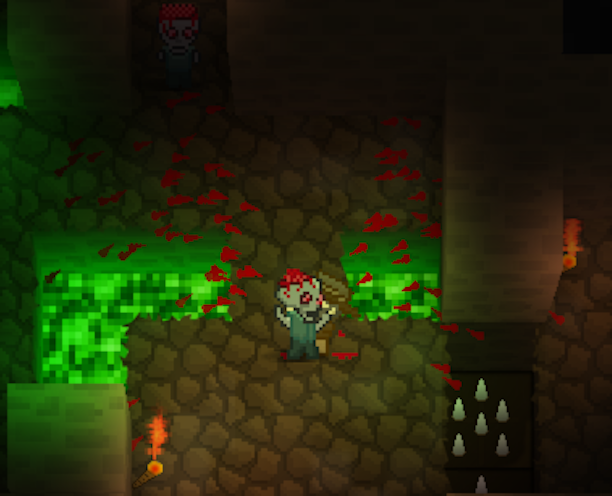 Note the incredible amount of blood present. Not quite a kid’s game now, right? 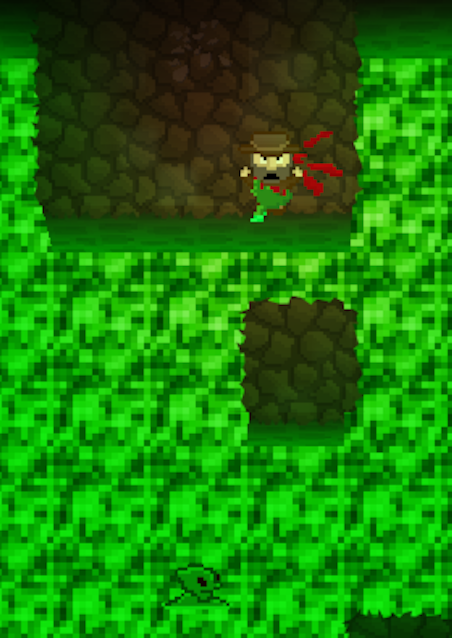 Of course, there’s more to this game than just running blindly and dying. In the approximately one hour play time, you will find yourself doing something that a lot of these types of games don’t really require- thinking. 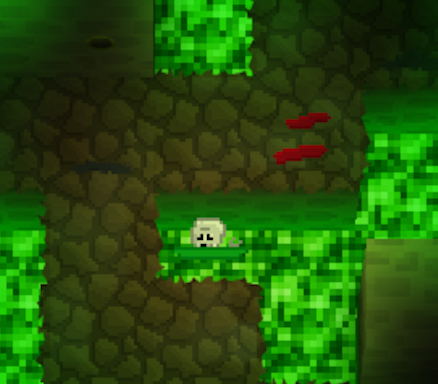 The levels are somewhat simple, for the most part, and none of them are very long. 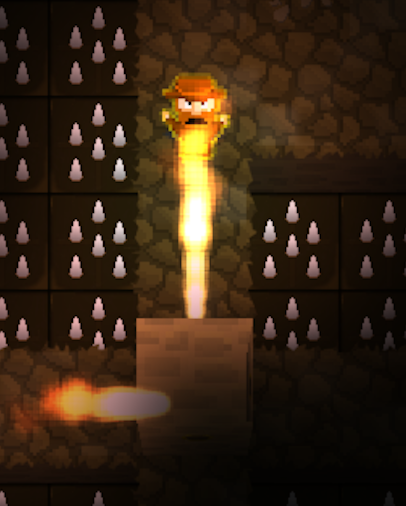 However, they do require you to move very quickly, with each level only having about a 30 second time limit- and those 30 seconds go very quickly, when you are trying to avoid boulders, pits, fireballs, zombies, floors that fall out from under you, and flame jets. It is a delicate orchestra of movement and keystrokes that gets Ohio Jack through each level, and timing is just as important as remembering what comes next. 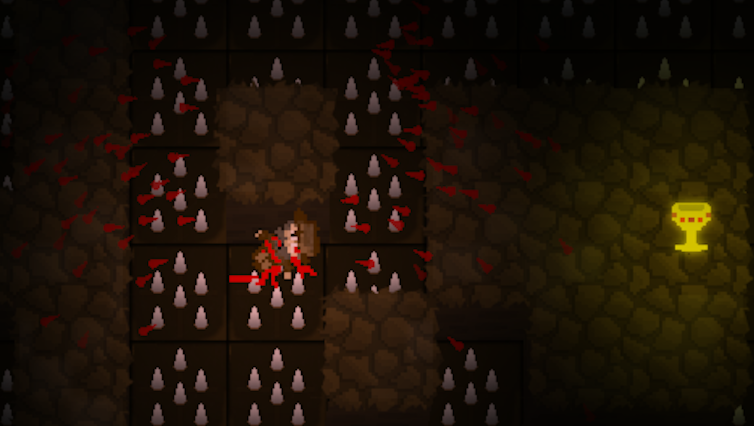 There is a modicum of the old “die at each turn until you know what’s ahead” trope, but every once in a while, you experience the elation of a run through a level without dying. You can duck under certain traps, like arrows, but you will find that ducking one wayward missile leaves you vulnerable to another. Therein lies Infinitrap‘s charm- the timing of your actions, as well as the realization several deaths later that you can actually take a longer route at the risk of running out of time. You can only really attack anything in one way, and it is only useful against the game’s sole corporeal enemy. 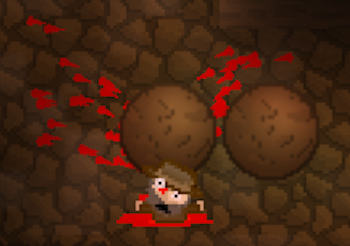 There are precious few instances where you can effectively use pressure plates to send arrows toward an enemy or open a trap door to impale somebody else on floor spikes. The main problems here are that the game is extremely short and that it is a relatively shallow experience. If you don’t die as much as I did, it might take you a good 30-45 minutes to complete. Keep in mind that this game was over $5, and therefore arguably overpriced for what it is- a very short game packaged with a detailed level editor. I suppose the whole point was to try to establish a community to create new and inventive levels to give the game continued life, but each level is so short that the process of creating a challenging and thoughtful level is just not worth its 30 second play length. Which is what makes this review so difficult. The game is fun. It is amusing, and good for a 45 minute jaunt. There is no real substance here, given a plot that was thrown together in a single weekend, a-la The Phantom Menace. However, in its short play time, it does give you some decent moments of accomplishments as you guide Ohio Jack through a seemingly impossible deluge of instantly deadly traps. It may be a bit pricey, but it is fun- and a modest/light challenge for about an hour. Maybe. There are definitely worse ways to spend five dollars.